It has been an active day on the markets. The U.S. session has given us a trend day up in gold, muted indices, and a slipping USD. As we move toward the forex close and sessions in Asia and Europe, there are a few economic events that are poised to shake the markets up. Three unique currencies will be under fire in the coming hours. The Euro, Canadian dollar, and Aussie will experience considerable volatilities. Given the periodic speaking engagements of the U.S. FOMC members, price action is likely to be wild. As always, have your stop losses down and leverage in check before the chaos ensues. It is that time of the week again, featuring the crude oil inventory cycle. The API release is due out today at 4:30 PM EST and the EIA number is slated for tomorrow at 10:30 AM EST. Going into the inventory cycle, this market is exhibiting several bullish characteristics. Price has broken above resistance, and the Bollinger MP/Daily SMA have crossed over. Since the sell-off of early February, this market has been slowly churning higher. Overview: WTI crude is in a holding pattern ahead of the coming inventories. 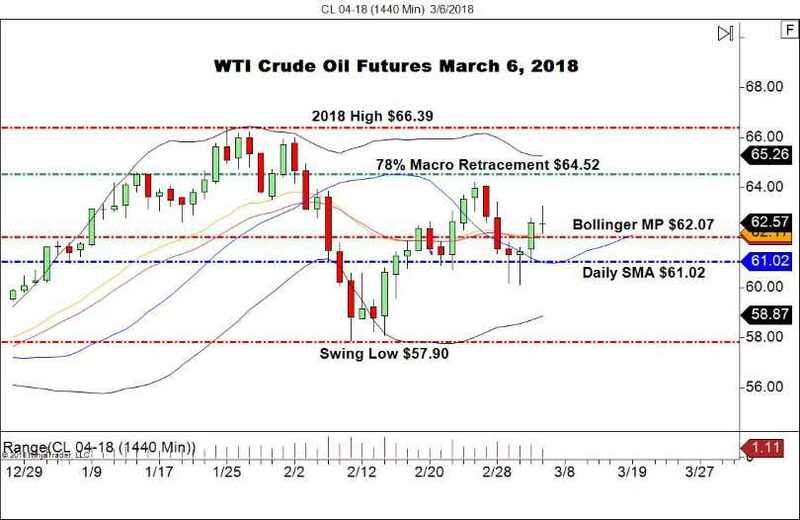 While topside resistance at $64.52 looms large, support levels are proving valid. I will be looking for this market to tighten up over the next 24 hours. If we get a big surprise from the inventories, then a short from the 78% macro resistance level may come into play. Until then, trade smart and for tomorrow!